While hardwood flooring makes an excellent addition to a home, choosing a random color can result in a disappointing flooring fashion mistake. The diverse color options available can make it difficult to choose the right wood flooring color for your home. You have to consider different aspects of your existing home to avoid an unpleasant final result. The simple tips below will help you pick the right color for your hardwood floor. Dark hardwood flooring may be appealing to you, but you should think twice about placing it in a small room. It can make the room look dense and gloomy, especially if the walls are also dark. For small rooms with low ceilings, use light colored floors such as white, gray, and beige to make them appear more spacious. 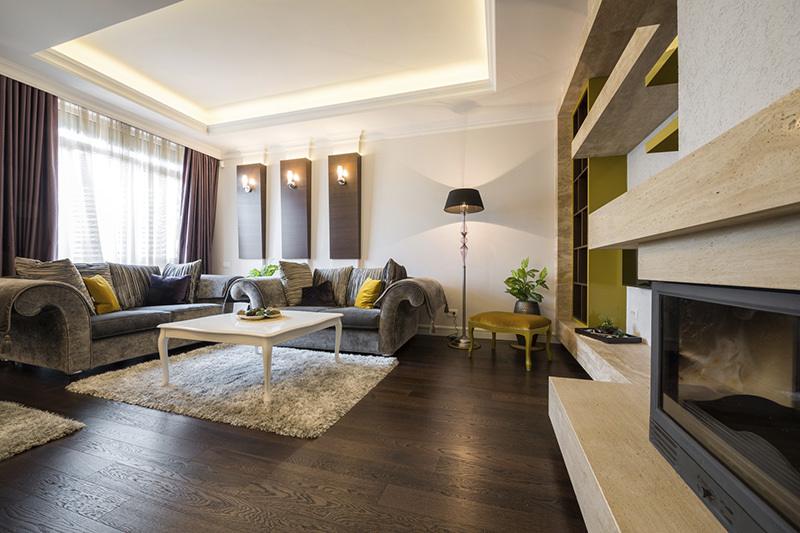 You can use dark hardwood flooring in large, open rooms with high ceilings to make them feel more intimate. The colors of your hardwood floors should go well with the décor in your San Jose home. You should take the color scheme of your cabinetry and furniture into consideration. The flooring color should complement or contrast the existing color scheme, but shouldn’t be of the same color. For example, you can install a dark floor in a room with white cabinets or use it to enhance light oak colored cabinetry with a dark grain. If your floor and table have a similar wood tone, you can use area rugs to create a color transition or break the space up. Both light and dark colored hardwood floors can accumulate dents and scratches if you’re not careful. However, their maintenance requirements differ. Dirt and dust tend to be more visible in dark colors than in light and white colors. You may see scuffs more easily in light colors. If hiding dust, scratches, and small dents is a great concern, opt for a natural colored floor in a matte finish. When choosing the ideal hardwood floor color, you should also consider the look you’d like to create. If you prefer chic and modern, go for dark colors. These are also ideal for urban condos and artists’ studios. If you want to make your flooring the focal décor element in a large open space, go for a bold, deep color such as certain shades of red, for example, Santos Mahogany or Jatoba. They are also excellent for adding character to offices and public interiors. If you want a classic look, choose traditional browns like walnut or chestnut stains, or natural unstained wood. Most importantly, don’t select colors just from checking photos and using virtual software. Make sure you see samples in person before scheduling your hardwood flooring installation. For more useful tips on picking the best wood floor color for your home, please contact us at Elegant Floors. For over 20 years, we’ve been offering high-quality flooring services to clients in Palo Alto, Sunnyvale, Mountain View, Menlo Park, Los Gatos, Los Altos and the surrounding areas. We offer sales, installation, and repair of a large variety of hardwood floor colors, finishes and surface styles. We’re committed to helping you get the best flooring options for your home and completing your project while maintaining your projected timetable and budget. Call us today at 650-961-1339 or 408-773-8624, or fill our contact form to get a free flooring sample, schedule a service, or ask a question.